Despite the Union government announcing many measures to boost the agriculture sector, reports say the sector grew by just 2.7% in the October-December 2018 quarter, the lowest growth recorded in 11 quarters. Writing in the Indian Express, Harish Damodaran says what is more worrying (external link) for the government is not the poor growth in 'real' terms (at constant prices) but the low growth in 'nominal' terms (at current prices adjusted for inflation). That the agrarian crisis is the Bharatiya Janata Party government's Achilles heel was evident from the adverse election results it faced in three major Hindi belt states -- Chhattisgarh, Madhya Pradesh, Rajasthan -- last year. Many observers have been quick to point out that the results reflected the discontent in the agricultural sector. "Farmers are seen as if they are a part of dustbin of history rather than a part of our present and future because farmers do not constitute a vote bank," Swaraj Abhiyan national President Yogendra Yadav -- an expert on issues related to farmers -- tells Rediff.com's Syed Firdaus Ashraf,. You stated that the farmers issue will play a big role in 2019 and as we see, it looks like we have ignored the problems of our farmers for very long. That is about the overall political economy of our country. Farmers exist, but they do not matter. Farmers are seen as if they are a part of dustbin of history rather than a part of our present and future because farmers do not constitute a vote bank. They are not consolidated and therefore they do not get attention. Sadly, the media in this country simply does not give them the attention they deserve, that is why farmers don't get noticed. And it takes politics for farmers to be noticed. I laugh when I hear in the media that farmers's issue should not be politicised. It is only after politics that farmers are noticed, otherwise they will not be noticed at all. The farmers did not vote en masse against the BJP (in Madhya Pradesh) as you mentioned in a lecture of yours in Mumbai and as it is being projected in the media, especially in areas like Mandsaur in MP, where the BJP didn't perform that badly. I said farmers's anger was much deeper and it was only partially reflected in the election result. And the reason for the partial reflection is the Congress party. It is simply unable to tap into the farmers's anger and offer an alternative. The contrast is Chhattisgarh where the Congress party did that and there you saw massive results. To my mind, rural distress in farmers's anger is real and deep, but it is reflected only in a limited way in the election verdict. People do not simply vote only because they are angry, they also want to see an alternative. When the Congress fails to provide that alternative, then they are indifferent. 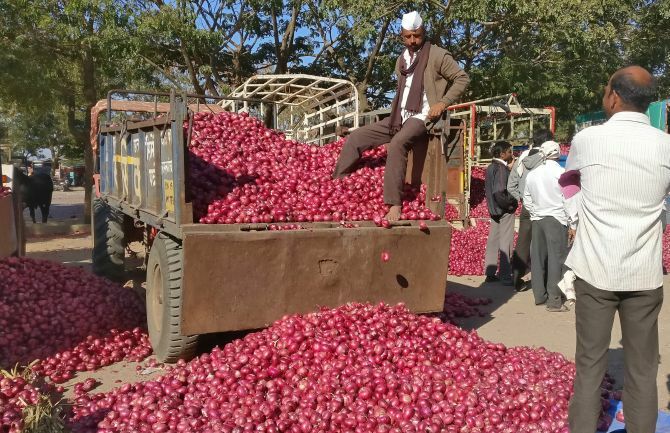 What can the government do when farmers over-produce? That is not true. The fact is that there is overproduction in some cases and underproduction in others. Overproduction takes place precisely in those things where there are government incentives. This country produces more paddy and wheat than it needs, why? Because, there is minimum support price from the government used for the public distribution system. Government committees have recommended again and again that please start providing incentives for coarse grain, but that does not happen. Number two, the import and export policy is such that when farmers get good prices from the international market, export restrictions are placed. And when farmers desperately want to ensure that there should not be any import, the government allows import. What happened to sugar? We had excessive sugarcane production and just at that point the government allows the import of sugar from Pakistan. So the government can do something. (Interrupts) To my mind, the government can do the following five things which are done all over the world, not just India. Greater procurement than is the case. Especially greater procurement of dal and coarse grain than is the case currently. Trade policies to be shifted in such a way that farmers can make use of the global market when production is high. Market intervention when prices plunge at that time government intervenes. It is a standard scheme. Farmer input cost to be reduced some of which are administered and some of which government can influence. Direct farmer support as was done in Telangana state. These are five things the government can do and the government knows about it. All the committees have said it, but the government does not do it because of a lack of political will. In Chhattisgarh, farmers did not sell paddy and waited for the election results. They knew if the Congress won, then they would get Rs 2,500 per quintal for paddy as the party had promised it in its manifesto. Don't you think farmers are blackmailing governments before the elections? It is a sad state of economic affairs. What is sadder is that words like 'blackmail' come to us only when we think of farmers. Tell me, what are the power industry and the coal industry doing in the country? Because of the advent of solar energy, traditional coal power has become less remunerative. That industry goes to the government and says pay us for this. Pay for what? Because your business model has gone wrong? The government could have refused, but it is coming to their rescue. We do not use the word blackmail at that point. I do not see 'What will happen to the economy?' debates happening on the amount of freebies that are offered to the corporate sector or loan maafi. What are haircuts? 90 per cent loan waivers being offered to the rich. What is bank recapitalisation? When the rich take loans and do not return and the government returns that money to the banks. What is restructuring 5:25 scheme? The government says don't return now, just tell us you will return after five years. Why don't we apply these schemes to farmers? This is sheer hypocrisy. I really wished farmers have the power to blackmail. I want to increase the power of farmers to blackmail the government as everyone in the country has the power to blackmail. Why has the Seventh Pay Commission come? Is someone not blackmailing the country? Those who are getting Rs 1.5 lakh a month salary start getting Rs 2.5 lakh a month. No one protests. Do you know the overall cost of the Seventh Pay Commission for government employees -- who are less than 1% of our population? It is more than the entire burden of procurement of agricultural commodities. Why don't we talk about these things? But farmers are not evolving. They are not producing things like palm oil which is the need of the country. They are producing only food grain for subsidies and MSP. So you want farmers to evolve? There are two ways in which farmers can evolve. One, the farmers get up in the morning and read business newspapers and say for the country's sake I should evolve. It is possible. I do not know many farmers who do that, but it is a possibility. The other possibility is that they are offered incentives in such a way that they are taken in that direction. We never say the corporate sector should evolve. We give them incentives and disincentives. In the existing system, all the incentives are loaded in favour of three crops: Paddy, wheat and sugarcane. Farmers produce it, so how can you blame them? You have given incentives only for this. In Marathwada, where there is scarcity of water because you have given them incentives to produce sugarcane, they produce sugarcane. So who is responsible? Are the farmers responsible? Farmers are made to look like villains. But if this is the only crop where they will have some assured income, why do you blame them? Why don't you restructure incentives in such a way that they grow more of dal? The Arvind Subramanian committee comes and says offer more incentives for dal. The government offers incentives for dal to farmers and they start growing which the government procures for one year. Next year, the government stops procuring. Farmers get Rs 2,000 less than the minimum offered by the government. There is no hue and cry about these things. Don't you feel there is just moral bankruptcy in these arguments? Do you think farming itself is no longer viable? Also, water levels are depleting across India. If farming is unviable, should we stop our lunch and dinner? The country will be a lovely place to live in. A lot of people are involved in farming, therefore it has become economically unviable. The fact is that farming is economically unviable today and if it was any other industry, we would have asked for its closure. If the plastic industry becomes unviable tomorrow, we would ask to stop it. Farming happens to be something which you cannot stop. You need it, therefore you need to make it viable. So rather than saying farming is unviable, should we not say why doesn't the government make farming viable because we have to eat? I don't know of any country which has stopped eating, and in that case we have to make farming viable. What else is the option?